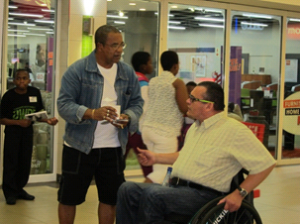 During the month of August The Disability Workshop Development Enterprise (DWDE), a non-profit organisation, is to be found in malls in Durban and Port Elizabeth offering the busy shoppers a coffee break while chatting about the many benefits for companies in employing people with disabilities and the services DWDE offers to employers and people with disabilities. The awareness events are part of the 2% Employment Campaign which DWDE launched in 2013 across South Africa with an associated target of employment of 1200 people with disabilities in the open labour market. The 2% Employment Campaign is a partnership between DWDE, the Jobs Fund, administered by the Development Bank of Southern Africa and the United Nations Special Rapporteur on Disability. The DWDE Chief Executive Ofﬁcer Ms Undere Deglon explains the need for such a campaign: “We understand business concerns about the risks of employing ﬁrst-time job seekers. Based on years of experience and lessons from other countries, we have developed a model to source, develop and place unemployed persons with disabilities into entry-level positions for the ﬁrst time in their lives. We can make this happen through member companies who join us in the battle against unemployment. DWDE can successfully supply motivated and dedicated employees from this previously untapped sector of the South African market of talent pool”. DWDE can source and train candidates for any type of entry- level position. These include call centre agents, cashiers, shop assistants, customer service agents, packers, cleaners, hotel and kitchen staff and can help companies to meet their employment equity target of 2% of their workforce comprising persons with disabilities. Shuaib Chalklen, the UN Special Rapporteur on Disability, says he is supporting the campaign because of DWDE’s “commitment to the employment of people with disabilities and because it supports the government of South Africa to ensure that 2% of the workforce comprise of people with disabilities”. People are however still not aware of the possibilities which exist within the workforce of people with disabilities and that organisations like DWDE are available to support employers and employees for a long lasting meaningful employment relationship. 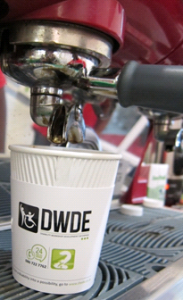 Therefore, DWDE has taking the 2% Employment Campaign on the road and are meeting people face-to-face in public spaces with DWDE Employment Advisors and Candidates available to provide information and answer any questions over a nice cup of coffee. With this DWDE is changing views on disabilities and showing that people with disabilities are ready to go beyond boundaries set by other people’s perceptions. DWDEs next stand will be at the Moffett on Main mall in Port Elizabeth on the 30th August. Swallow & Co will be making artisan Barista coffee.